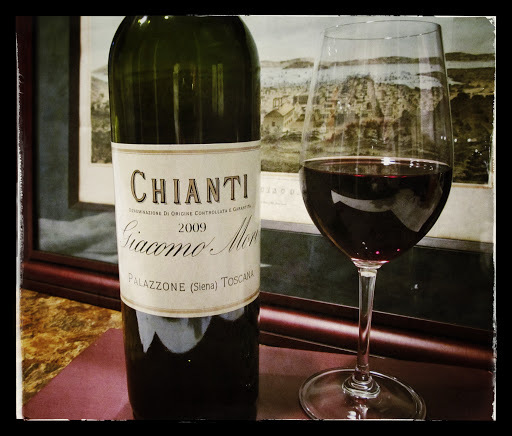 My sister is a huge fan of Chianti, so it was no surprise when she brought over Giacomo Mori Chianti 2009 last night to accompany dinner [quinoa cakes with smoked cheddar and roasted peppers, faux chipotle sausage and mesclun salad] and relaxing on the couch watching the Rangers game. Giacomo Mori is a small family owned estate that was founded by the Mori family in 1790. The family sold their grapes and wine to local cooperatives until the mid 1990’s when Giacomo Mori renovated the vineyards and cellars and began estate bottling his own wines. Giacomo practices organic and sustainable methods in both the vineyards and winery. The 2009 Chianti was fermented in stainless steel, aged for a year in large Allier casks and third use barriques, then aged for another 3-6 months in the bottle before release. Ruby-garnet in colour, after decanting aromas of cherry, earth and leather swirled about in the glass. Cherry and briar berries were joined by smooth leather elements in the medium body. Traces of white pepper and espresso notes were expanded by elongated dry tannins in the lingering finish. Very dry and well balanced; this is a tranquil, refined glass lovely at the table.